Model history: : the Honda CBX 750 F was presented to the public press in 1984. In that time, nobody could find any explanation about this bike, when Honda had just announced the death of the in-line-four engines with its range of V ones. Even in this capacity, Honda fought on the road, and at the showrooms, with its VF 750 F for the sport bike-crown, with the Kawasaki GPZ 750, and the Suzuki GSX 750. When presented in Kyalamy the CBX 750 was the only in-line-four engine, surrounded by a panoplies of V engines, VF 1000 F, VF 1000 R, VF 500, V45 and V75 Magna… and, from reading magazines tests from that era, it was the only one that it didn't break, with the all the VF motor clacking & splashing around all the coolant. Because of those facts, Honda released this bike. Nearly an incredible 60% of the VF 750 British bikes sold ,had their cams melted, because of a lubrication problem. In its first two years of production. And without a fix, even with new cams, mods in the lubrication system, special tools to hold the cams in place, and also when a valve adjustment was done. This was a seemingly endless nightmare for the owners with this problem, and sleepless nights for the rest of the owners without the problem, with the knowledge of this potential disaster in their own lovable and expensive new purchase. So, the VF 750 disaster prone issue, plus the overheat problems in the VF 500 & 1000 series, the mechanical complexity, and the disastrous handling, and the excessively weighted VF 1000 R, born to compete, but with zero possibilities with the Ninja 900 and FJ 1100 around, near sunk the reliability of the Honda image. So Honda did a step back, to the one thing that they know, to be near the best makers of the in-line-four, that launched Honda to the supremacy of the world bike market with the CB 750 released in 1969. In fact, even de V series has survived until today, in a long dynasty of sport-tourer bikes. The best sport bikes of today from Honda keep the in-line-four configuration, although , they are now water cooled. The CBX engine is a kind of transition between old & new: even air cooled, the engine is so narrow that the chassis down tubes keep oil in them. And the valve train is hydraulically operated, something unique in the motorcycle world, although normal in other parts of the automotive industry. The idea is no maintenance, and I don't understand why this trait is not common between bikes, because it works and saves a lot in a service in the workshop. This is really is the last Honda air-cooled sport engine. Honda used this exact engine, to launch the CB 750 F model in 1992, with minimum differences, basically with less power, a bigger crankcase to increase the oil capacity by 1 l, and a cable operated clutch instead of the hydraulic one. I think that my FJ has arrived at a point, where additional changes are not worth the effort or cost, because I'm going to spoil its everyday use friendship (i.e. fitting rear sets), the additional gains on power are not worth the cost (i.e. a Cosworth pistons set) or it is ugly (i.e. handlebar). Only 2 things are in the future budget, a deeper oil pan to carry 1 more litre of oil, and to adapt any kind of anti-hoop clutch, like the one that fits my new Honda, which is marvellous. So it might be boring to not have anything to dismount or fiddle on, therefore I started to look for a second bike. The excuse was to have the bike in Madrid to travel all summer, but the reality was that my 3XW model was perfect for that duty, and I sold it because really it was the same bike that my 3CV, only that bit more sedate. In September 2009 I saw on the internet, my present CBX. Possibly, it is the only one in Spain because Honda never sold it here. And it is a very rare bird, because I saw only one in my life, in 1986, an Italian registered bike . My friend Jose Carlos had tested a normal CBX 750 F a couple of months ago, but the price was excessive for the condition. In 1987, when I bought my 1100 Katana I tested one black pristine CBX 750 F. It was a pity because when I fell in love with the bike, then checked the compression, the nº 3 cylinder had no compression at all, so I finished buying the stability nightmare that is the Katana ,that near killed me ! Since then, I've liked this rare Honda model. In December 2009, around Christmas time, I saw & tested the bike in Galicia. The Honda was in pristine condition from the outside, completely original, perfectly stored & cared for, by an owner that after time confessed to me that the CBX was HIS bike, and even, although he owns a Paneuropean, he still misses the CBX . Everything seemed perfect, with no rusted screws or oil spills. It started at the first touch of the button and even with the throttle on, it sounded crisp and perfect, when at idle the engine chain-rattled, loudly clearly from the inside. If I bought the bike, it was in my mind to travel on mainland Spain in spring and bring the bike to Tenerife, where it would be completely restored as new. So, that rattle near discouraged me to buy it, but after consulting with my Dad, and following the owners assurance that nothing was going to happen, I tried my luck, thinking that the rattle was due to the cam chain tensioner. I paid for the bike and it was stored on February 2010 until the spring. In June 2010 I was in Galicia and my friend Jose Carlos was waiting for me, riding his immaculate FJ, bringing with him, a battery charger. One afternoon was spent working on the bike, changing spark plugs, cleaning the fuel tap & the crankcase depressor, oil level, air pressure on suspensions and tyres and chain greased and ready. With a new KN, fork protectors and foam grips fitted and to Madrid. Not directly, of course. We did a B & C roads 2 days travel to Madrid. What did I expect from the bike? not too much really, and even less, compared with my FJ. I was ready for a shot suspension system, with 24 years on them, rock hard tyres Dunlop GT501, 120 rear instead of the OE 130, not too much speed & power...Not very optimistic. And on this trip, arose a lot of surprises, thankfully, a lot of pleasant ones, like its comfort, sweet & electric engine, handling, agility, good suspension, combined with speed and stability. It also pointed out a few bad things, like the drive chain shot, and that engine drinking the oil. More than 1 litre/100 km. Each time you stop after a five hundred kilometre journey you must refill the oil sump, with difficult access. When in Madrid, I changed fork oil, tyres (BT 45, with 140 rear), drive chain & sprockets kit, oil, oil filter, brake system cleaned and new metallic hoses. Along with the clutch oil changed, and carbs synchronized...then to ride the thing around mainland Spain!. 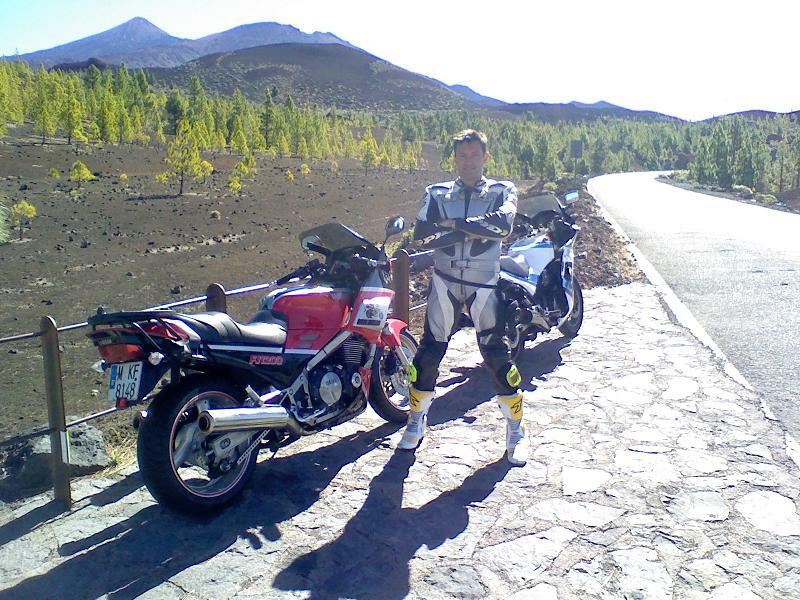 I rode around 3.000 kms more, where the bike behaved impeccably in various +500 kms ride-hard days, apart from the high oil consumption, I arrived to Tenerife without any mechanical hitch . And up to date. I will add this section with everything that I plan to do to my Honda. And it will be a lot of things.